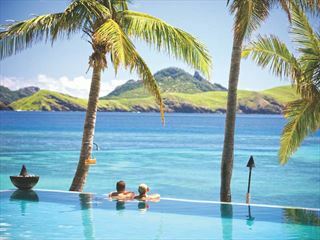 Malolo Island Resort, Fiji. Book at Tropical Sky today. 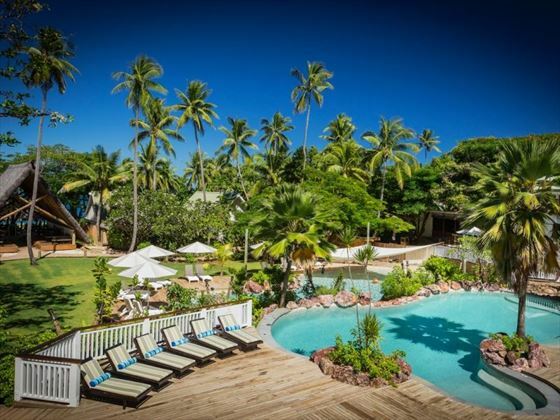 Escape to Malolo Island Resort for a relaxing, secluded break. Nestled on the gorgeous Malolo Island, and only accessed via catamaran, speedboat or seaplane, this resort truly embodies the intimate island lifestyle. 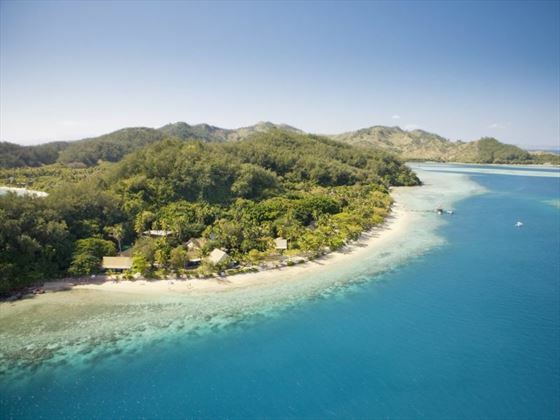 Its beachfront location offers incredible views of the Fijian sunset, as well as pristine white sands, fun water sports, and a warm, tropical climate. You can take part in a variety of activities, or simply soak up the sunshine, taking advantage of the resort’s purposeful lack of WiFi, TV and radio to really help you relax. 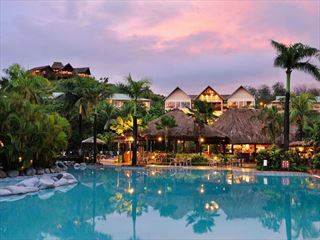 With friendly staff, incredible bures and sumptuous restaurants, you really won’t want to leave this island paradise. This beachfront resort is located on the beautiful, secluded Malolo Island, surrounded by azure waters, pristine white sand, and luscious rainforest. The archipelago can only be accessed by private speedboat, a 55 minute catamaran or 10 minute seaplane, adding to its island charm and offering a truly intimate ambience. 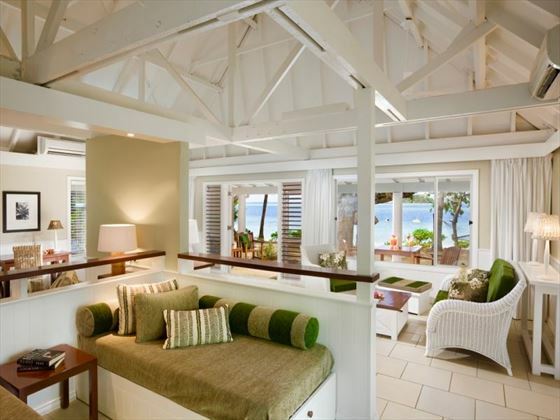 Oceanview Bure – Airy 33sqm villas featuring a large veranda, one king size bed, and two single beds. Sleeps a maximum of two adults and two children. 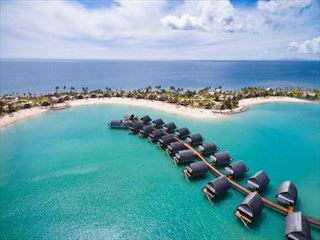 Deluxe Oceanview Bure – Gorgeous 50sqm villas with a veranda, a separate bedroom with a king size bed, and two single beds in the big living area. Sleeps a maximum of two adults, two children, and one infant in a cot. 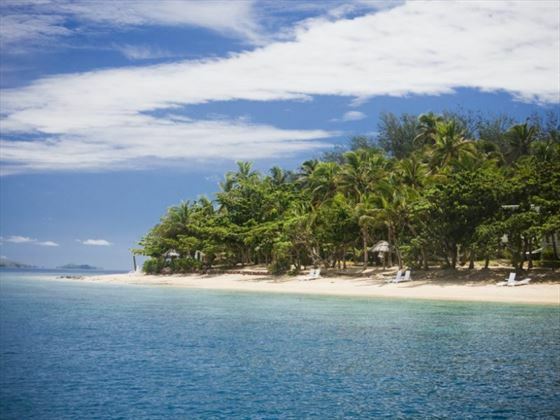 Tadre Beach Bure – Perfect for a honeymoon, tadra is Fijian for ‘dream’. Located at the very end of Mololo Beach, these 50sqm villas are secluded from the rest, and offer an intimate ambience. 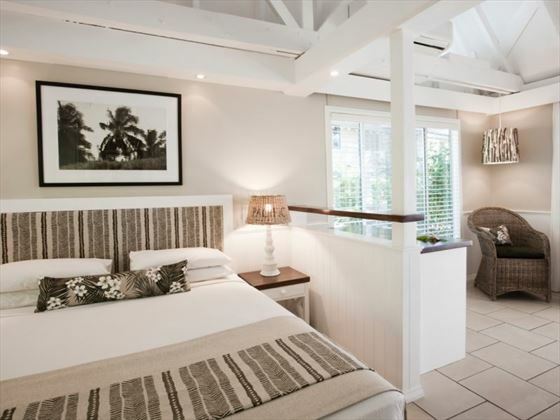 Featuring a king size four-poster bed and two daybeds in the spacious living area. 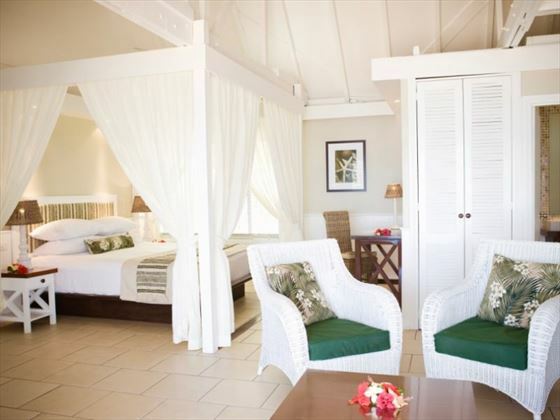 Guests also receive a complimentary bottle of sparkling wine and tropical fruit platter upon arrival. Sleeps a maximum of two adults. 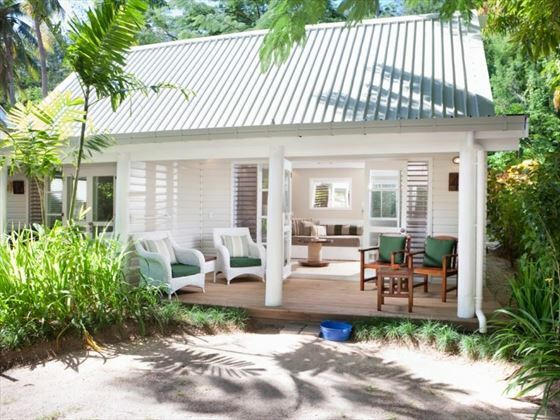 Family Bure – There are four family bures, all sleeping a maximum of seven guests. Two of the bures are 100sqm and two storeys, with two bedrooms featuring a king size bed, one en suite, one main bathroom, and three single beds in the living room. The other two are 92sqm and featuring two bedrooms, both with a king size bed and en suite bathroom, plus three single beds in the living room, plus a veranda. 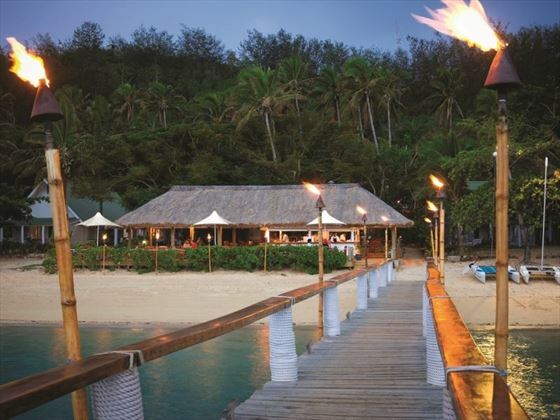 Beach Bar – Sitting along the water’s edge and offering spectacular sunset views and a laidback island vibe. Featuring fresh salads, gourmet and traditional pizzas, burgers, seafood and fish and chips. In the evening the restaurant becomes a venue for fun activities. Open daily except Saturday nights. Open from 11.30am-4pm and 6pm-9pm. 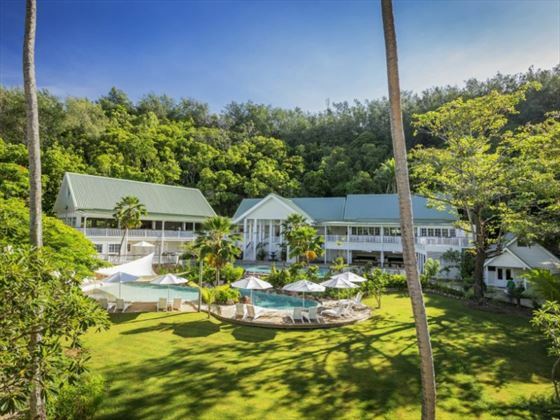 Terrace Restaurant – Located in the resort’s restaurant complex, this colonial inspired eatery has fantastic views of the swimming pools and gardens, offering a dedicated buffet, and modern Pacific Rim cuisine. Open 7am-10am, 11.30am-2.30pm and 6.30pm-10pm. 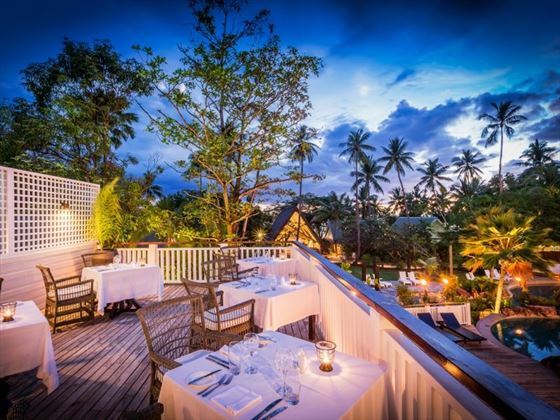 Treetops Restaurant – Nestled along the veranda of the restaurant complex, this classy restaurant overlooks the adult pool and lounge areas. Only available to adults and children over the age of 13, this restaurant is a more formal affair, offering a daily changing three course a la carte menu. Open 6.30pm-10pm. The option of a beachside meal, jetty dinner, or deluxe picnic hampers can be arranged with the Front Office staff with 24 hours’ notice. 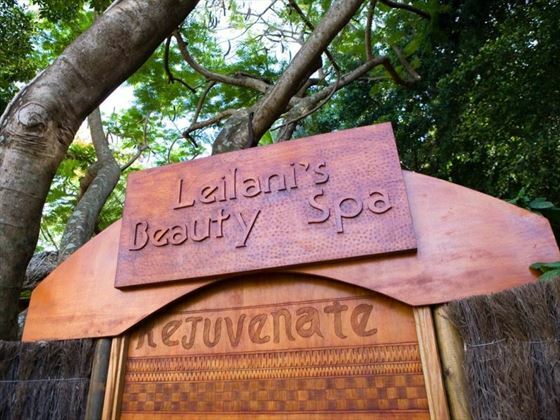 Leilani’s Spa – Nestled amongst a luscious rainforest setting, this beautiful, soothing spa will nurture your spirit and restore your balance using Pure Fiji products. The spa consists of three open air treatment bured, including one for couples. 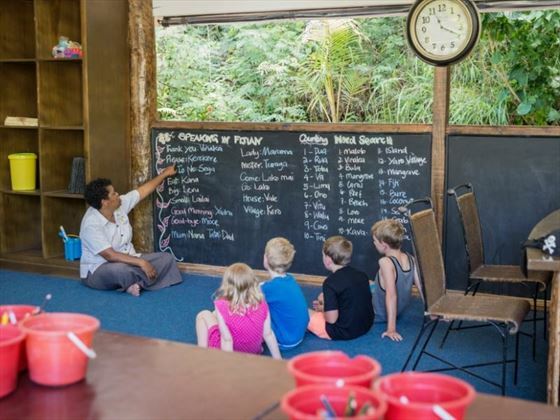 Tia’s Treehouse - A free kid’s club nestled under a giant mango tree, offering plenty of fun Fijian activities and games, and an outdoor playground. Available for children between 4 and 12 years’ old. Khail’s Club Lounge – A lounge for teenagers between the ages of 13 and 18, with table tennis, bean bag lounges, a satellite TV and WiFi. A charming adult-only beach property, Tokoriki Island Resort is surrounded by tropical flora and looks out onto exotic scenery - a blissful setting for a romantic escape.